We house all of our software instances with Amazon's EC2 cloud in a region closest to your location. Unlimited scaling, failover, and expansion capabilities give our sites 99.9% up time. When it comes to your business data, nothing is more important than speed, performance, and disaster recovery capability. Each of our installations makes use of Amazon's EC2 Cloud, allowing us flexibility in regions, failover mechanisms, scalability, and reliability with a few mouse clicks. Sit back and relax knowing your business data is secure, redundant, updated, and performing at its optimal level when you use our delivery software. Managing and reporting on your data has never been easier...everything is at your fingertips! You can easily view some of the most important information at any time, right on your admin dashboard. Stats like your sales this month vs. last month, new customers this month vs. last month, YTD sales, total outstanding, top routes, top products, top customers, and health of the system information are all available as soon as you open your dashboard. This gives you an immediate look at how your business is doing without digging through a bunch of spreadsheets. 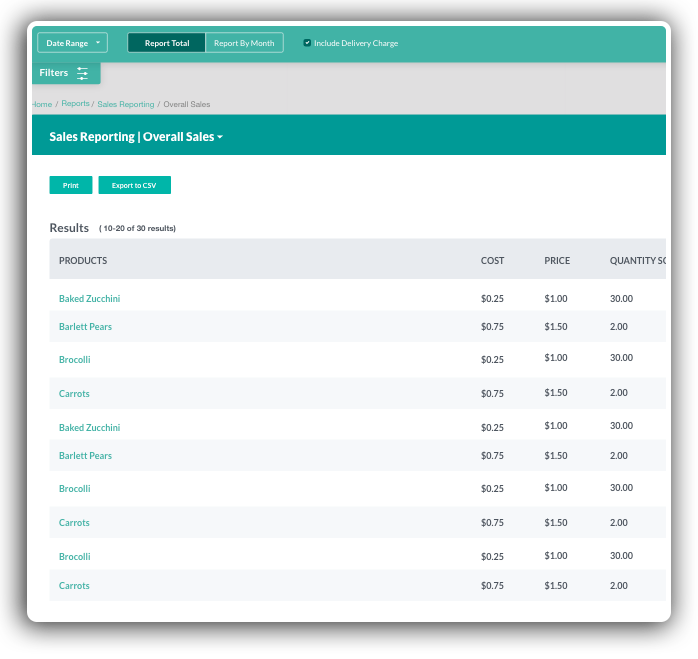 Easily track your sales by a number of factors. You can track sales by date range, per route, per product, per membership level, or a combination of any of those variables. Alternately, our user-friendly approach allows the delivery management software to produce a list of everyone who ordered "x" product during a certain date range, find out what your profit is on "x" route for a date range, and much more. You can sort your results, print them for records, export to an Excel spreadsheet, etc. Track down who your top customers are, find out which of your customers don’t have a recurring order setup, or produce a screen of results showing customers that haven't ordered from you in the last 60 days. Send them all an email directly from the report, export it to Excel, print, or sort your results. Need to keep track of customers to follow up with each day or week? No problem! Our integrated delivery software allows you to use the customer follow-up report and instantly know who you need to contact. Find out who is on hold, who is on vacation, who hasn't paid, how many new customers you've had, and what that means money-wise...the data is endless. Using our ordering and delivery management software, you can produce reports of your current inventory or find out how much inventory you'll need for next Thursday's orders. Search for how much of "x" product you sold during last year at this same time. Got pre-order products? Pull up a complete list of all the orders so far, easily find your sale items, find items that are disabled, out of stock, or low on inventory, setup as a first-time order special - the possibilities are limitless when you use Delivery Biz PRO’s home delivery software. Along with the sales and profit reports, you can easily export all financial data in CSV format. You can find out how much in check, cash, and electronic payments were posted for any given date range, how much in credits or adjustments were issued to customers for a date range, or find out what's currently outstanding in the system. Need to know how much tax you charged for a given date range? No problem, we have a report for that. 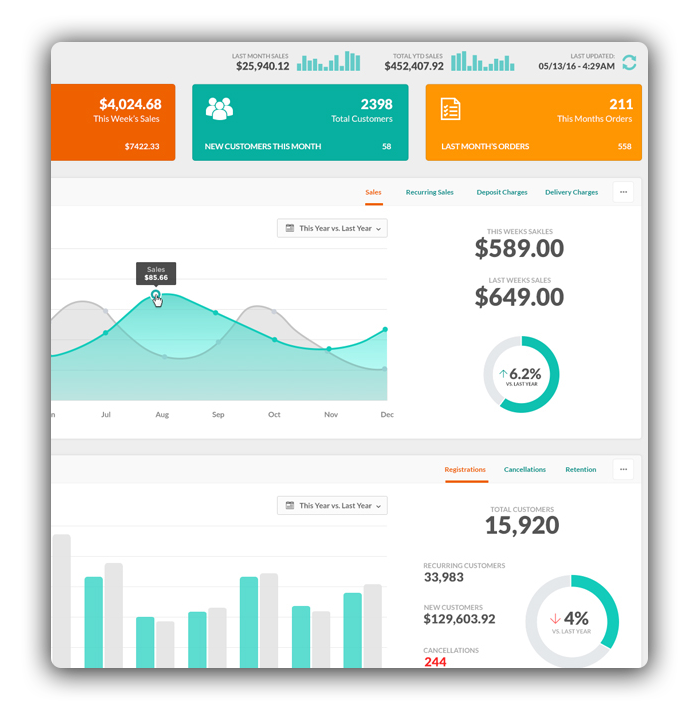 We've done our research on just what business owners are looking for in their delivery software for small businesses, and have made it easy to view your business stats on your dashboard. There are too many reports in our system to list them all out - but some of the specialized reports we have for certain functions include: birthday reports, cross-selling reports, deposit reports, follow-up reports, friend referral reports, forecast reports, minimum order reports, vacation reports, and many, many, many more. Get access to all of the necessary tools with our delivery management software. Each of our installs is housed on its own DEDICATED SERVER. This means your website is the only one on the box...giving you full access to the CPU, RAM, and hard-drive resources your site needs to run fast, smooth, and reliably. Twice-daily data backups mean that you don't have to worry about calamity. You no longer need to lay awake at night wondering if you remembered to backup the database of customers and orders you've worked so hard to build over the years - we take care of the headache for you! Security and server updates are automatically controlled by our staff - eliminating the need for an internal IT staff on your end. Want a copy of your customers and their relevant information? No problem - you can export your users, their orders, standing orders, payment information, and a myriad of other pieces of data at the click of a button. Easily import this information into any program that accepts standard text or delimited files! Because our system is web-enabled - you can know what's going on with your business from anywhere in the world - log in from vacation in Mexico and check in on staff progress, run billing, or use any other function without having to be on-location. Our list of features and functionality grows each month based on the needs of those who use our delivery management software - that's the beauty of web-based software! It’s always changing and getting better. Is Delivery Biz PRO a good match for your delivery business? Find out in 20 seconds or less.